Guirguis Lotfi (b. 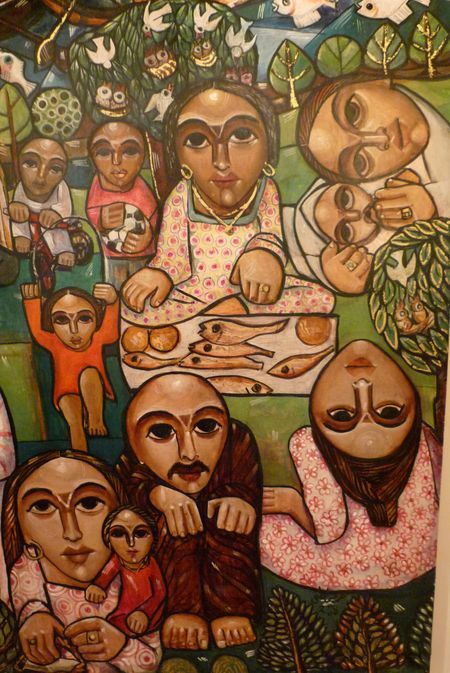 1955) is a Coptic Egyptian artist who represents a fresh air into Coptic art. 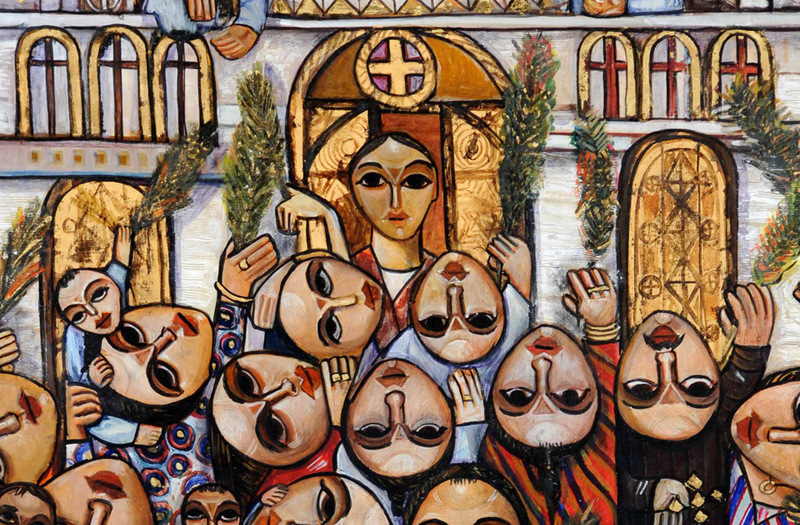 As he tries to preserve Coptic elements in his work, he does not restrict himself to the spiritual but takes on lay subjects as well, without losing the sublimity of the first, and introduces new themes, subjects and life into Coptic art. He is a scholar, holding a PhD on the “Philosophy of Art” with a thesis focused on “Coptic Art and Its Effect on Modern Art”. His extensive studies have had a major impact on his work, providing Lotfi with an immediately recognizable style and a unique, unparalleled technique, reminiscent of religious iconography, making his works true masterpieces. His use of egg tempera and gold leaf on treated wood, a long forgotten technique, is a testament of his passion and pride about the past, while tackling contemporary and popular subject matters. The apparent naivety of his art – every day scenes – reflects sincerity, insight and a deep reverence for the diversity of the Egyptian culture. Lotfi truly brings the past into today to provide answers for tomorrow. 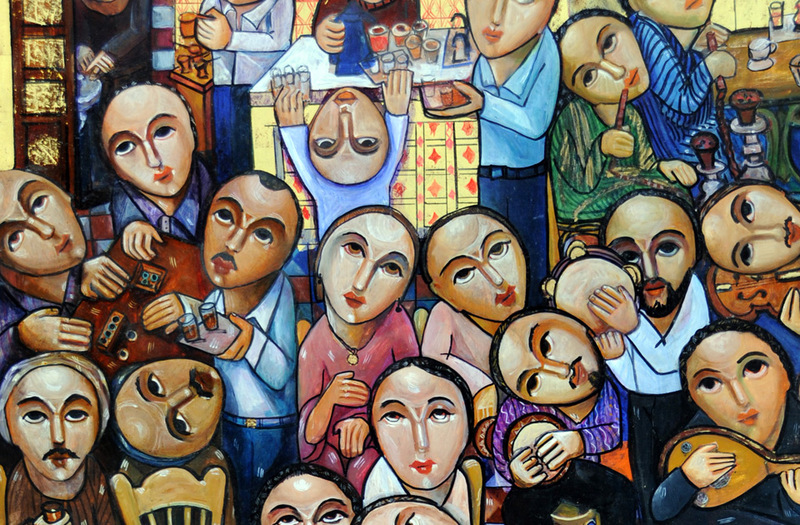 Guirguis Lotfi’s art sets itself free from the straitjacket of the traditional Coptic art but retains its original features. The Coptic element in it is recognisable, and is seen as it interacts with modern life in all its manifestations. He does weddings, prayer, child play, games, baking, pastime, beach, coffee shops, naming ceremonies (simaya), eating, smoking shisha, music, dancing, suckling babies, ululation, merry-go-round, swimming, bathing, and boating. His depictions show the Nile, gardens, greenery, white birds, white fish (some upside down! ), fanciful trees, and coloured, bright costumes. The faces, which seem superimposed on his figures, are egg-shaped (oval) with large almond-shaped eyes, prominent ridge above the eye-brows, rounded top of the brow, low nasal-bridge, straight nose and rubber-stamp mouths. 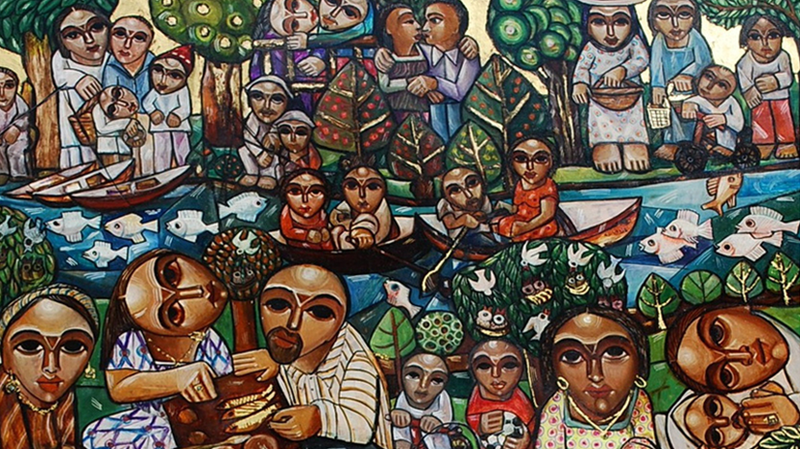 No one can fail to recognise Guirguis Lotfi’s beautiful art. I reproduce below some samples of his work but would urge the reader to visit ArtTalks Egypt and Al-Ahram Multimedia for more of his fascinating art.